The WHL trade deadline arrives today at noon MT. That’s 11 a.m. Pacific and 1 p.m. Central. 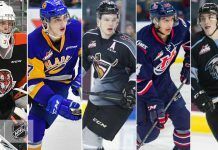 If you follow the WHL, make sure you check out Small Thoughts At Large, the blog where Alan Caldwell tracks all the WHL bantam draft picks. He has created a spreadsheet for each season and tracks the transfer of picks via trade, also noting what was involved in each transaction. It’s a tough job because not all of these trades are cut and dried, but Caldwell does a terrific job of sorting through it all. His blog is right here and the link to the spreadsheets is on the right-hand side. 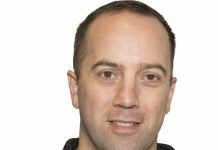 Over the last while, Todd Harkins, the first-year general manager of the Prince George Cougars, has experienced the downside of the WHL’s trade deadline and he wishes that some people would take a look at how they operate. Moments after dropping a 2-1 shootout decision to the visiting Kelowna Rockets, the Kamloops Blazers announced two trades, both involving 20-year-old forwards. . . . The Blazers sent Mike Winther to the Lethbridge Hurricanes for an eighth-round pick in the 2017 bantam draft and acquired F Joel Hamilton from the Vancouver Giants for a sixth-round pick in 2017. . . . Both players were healthy scratches on Friday night. . . . Winther, from Trochu, Alta., has 16 points, including six goals, in 40 games with Kamloops. He also has played with the Prince Albert Raiders and Calgary Hitmen. In 271 regular-season games, he has 158 points, including 76 goals. However, he hasn’t scored since Nov. 19 and has been a healthy scratch for two straight games. The Blazers had acquired him from Calgary for a 2015 fourth-round draft pick and a seventh-rounder in 2017. Taken 16th overall by Prince Albert in the 2009 bantam draft, he was a second-round pick of the Dallas Stars in the 2012 NHL draft, but was never signed. . . . Hamilton, from Cochrane, Alta., has 27 points, 10 of them goals, in 40 games with the Giants this season. He played two seasons with the Red Deer Rebels, before moving to the Giants, where he played last season for Don Hay, now the head coach in Kamloops. In 224 career games, he has 130 points, 37 of them goals. Vancouver gave up a third-round pick in the 2014 bantam draft to get Hamilton from Red Deer. Hamilton was a fourth-round pick by Red Deer in the 2009 bantam draft. The acquisition of F Mike Winther left Lethbridge with four 20-year-olds, a situation that was resolved when the Hurricanes dealt F Zane Jones to the Vancouver Giants for the rights to F Johnny Wesley, 17, who is with the BCHL’s Surrey Eagles. . . . Jones, from Olds, Alta., has also played with the Everett Silvertips, Calgary Hitmen, Victoria Royals and Chilliwack Bruins. . . . The Bruins selected him in the fifth round of the 2009 bantam draft. . . . This season, he has 30 points, including 18 goals, in 36 games with Lethbridge. In 229 regular-season games, he has 134 points, including 66 goals. . . . Wesley, from White Rock, B.C., has 21 points, five of them goals, in 32 games with the Eagles. He scored one goal in his lone game with the Giants this season. The Kelowna Rockets added a third 20-year-old to their roster with the acquisition of F Chance Braid from the Prince George Cougars. In exchange, the Rockets gave up F Brogan O’Brien, 17, who is from Prince George. . . . 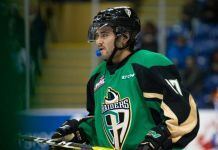 The Cougars had gotten Braid from the Prince Albert Raiders over the summer. He had 13 points, including eight goals, in 35 games with the Cougars. A power forward-type, he’ll add some sandpaper to the Rockets’ roster. . . . O’Brien was a 10th-round pick by the Rockets in the 2010 bantam draft. 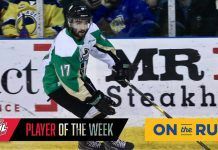 He is playing with the BCHL’s Prince George Spruce Kings and had 15 points, including six goals, in 48 games going into weekend games. The Edmonton Oil Kings acquired D Marshall Donald, 19, from the Calgary Hitmen for a 2015 fourth-round draft pick. . . . Donald, from Edmonton, has eight points in 32 games in his first season with the Hitmen. He was a third-round pick by Calgary in the 2010 bantam draft. . . . Donald played the last three seasons with the AJHL’s Sherwood Park Crusaders. Prior to that, he was with the Edmonton-South Side Athletic Club program. . . . Donald is out with an undisclosed injury but is expected to join the Oil Kings early next week. Dec. 10 . . .
To Kelowna: D Josh Morrissey (95), F Gage Quinney (95). To Prince Albert: D Jesse Lees (95), F Austin Glover (96), 2016 second-round pick, 2017 third-round pick. Dec. 12 . . .
To Red Deer: D Nelson Nogier (96), F Austin Adamson (96). To Saskatoon: F Mason McCarty (97), 2015 second-round pick, 2016 first-round pick. Dec. 16 . . .
To Calgary: G Thatcher Demko, 19, who is at Boston College. To Spokane: Conditional draft picks. Guy Flaming of The Pipeline Show tweeted that he had it as a second-rounder in 2015 and a second- or third-rounder in 2016. 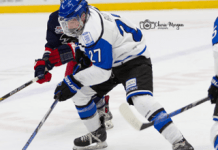 Dec. 27 . . .
To Swift Current: D Griffin Foulk, 19. To Lethbridge: Conditional eighth-round pick in 2016. To Red Deer: D Colton Bobyk, 18, and a 2016 fourth-round pick. To Spokane: D Nick Charif, 19, a second-round 2015 pick and a conditional sixth-round 2016 selection. Jan. 2 . . .
To Brandon: F Morgan Klimchuk, 19. To Regina: F Jesse Gabrielle, 17. Jan. 5 . . .
To Medicine Hat: D Kyle Burroughs, 19, and F Dryden Hunt, 19. To Regina: D Connor Hobbs, 17, and two draft picks — second-rounder in 2016 and third-rounder in 2015. To Saskatoon: D Kolton Dixon, 19. To Red Deer: G Trevor Martin, 18. To Red Deer: F Connor Gay, 19, and three bantam draft picks — a first-rounder in 2016, a second in 2015 and a seventh in 2017. To Regina: F Jake Leschyshyn, 15, and a fourth-round pick in 2017. To Brandon: D Reid Gow, 20. To Spokane: A fifth-round pick, Spokane’s option for 2015 or 2016. Jan. 6 . . .
To Kelowna: F Leon Draisaitl, 19. To Prince Albert: F Tomas Schmidli, 18, D Dalton Yorke, 18, and three bantam draft picks — a first-rounder in 2015, a fourth-rounder in 2016 and a conditional fourth-rounder in 2016 or 2017. To Prince George: D Tomas Andrlik, 19. To Prince Albert: A 12th-round pick in 2015. To Moose Jaw: D Connor Clouston, 18. To Kamloops: A fifth-round pick in 2017. To Calgary: G Brendan Burke, 19. To Portland: G Evan Johnson, 18, and a fourth-round pick in 2016. To Lethbridge: D Brady Reagan, 17. To Regina: F Taylor Cooper, 19. To Victoria: F Alex Forsberg, 19, a third-round pick in 2015 and a fourth-round pick in 2016. To Saskatoon: F Brayden Dunn, 16, and a first-round pick in 2017. To Portland: D Adam Henry, 20. To Saskatoon: A second-round pick 2017. To Moose Jaw: F Axel Blomqvist, 19, a third-round pick in 2015 and a fifth-round pick in 2017. To Victoria: D Alexey Sleptsov, 18, G Justin Paulic, 19, and a sixth-round pick in 2015. Jan. 7 . . .
To Tri-City: F Tyler Sandhu, 18. To Red Deer: Fourth-round picks in 2015 and 2016. To Kamloops: D Marc McNulty, 19, and a 2016 sixth-round draft pick. To Prince George: D Josh Connolly, 19, and a 2015 sixth-round draft pick. To Saskatoon: D Brycen Martin, 18, and a conditional 2017 fifth-round draft pick. To Swift Current: D Jordan Thomson, 18, and a 2016 first-round draft pick (originally belonged to Red Deer). 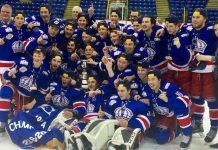 Jan. 8 . . .
To Kootenay: D Lenny Hackman, 19. To Lethbridge: A 12th-round pick in the 2015 draft. To Saskatoon: F Mitch Skapski, 18, and 2015 fifth-round draft pick. To Victoria: A 2016 fifth-round draft pick. To Lethbridge: G Jayden Sittler, 18. To Victoria: A 2016 seventh-round draft pick. To Seattle: F Cory Millette, 19. To Prince Albert: A sixth-round pick in the 2015 or 2016 bantam draft. Jan. 9 . . .
To Kelowna: F Chance Braid, 20. To Prince George: F Brogan O’Brien, 17. To Edmonton: D Marshall Donald, 19. To Calgary: A 2015 fourth-round draft pick. To Kamloops: F Joel Hamilton, 20. To Vancouver: A 2017 sixth-round draft pick. To Lethbridge: F Mike Winther, 20. To Kamloops: A 2017 eighth-round draft pick. To Vancouver: F Zane Jones, 20. To Lethbridge: F Johnny Wesley, 17.